The promised "very special wine at a price to match", as described here by Johann Krige last month is on sale. Cybercellar.com and Wade Bales Wine Society. Only 1000 bottles have made, the grapes coming from the oldest vines on the farm, and the first 600 have been released with a price of 1,000 ZAR per bottle (82GBP/132USD). The last tranche of 400 bottles will be released later this year. There is a limit of 36 bottles per customer, but according to .Angela Lloyd's blog all the available bottles sold out instantly. Over on eBob (Robert Parker's forum) Chaad Thomas thought Fairview's 2005 Pinotage was a great wine. "Dark garnet, with some ruby reflections. Bright. Bold nose is smoky, gamey, and herbal. My wife says it smells like an Italian [spiced] stable! It's definitely redolent of wild berries and true to that SA funk. Fresh and lively up front, the wine shows ripe, supple fruit and good weight. It's quite harmonious, with a good balance of earth tones and savor. The fruit is a juicy blend of cherry, raspberry, and cranberry...maybe blackberry. Nicely knit all the way through the middle, too. The finish is a progressive evolution from the palate, allowing a nice glow of salty, beefiness at the end. Mouthwatering. In all, this is still a great wine, true to my memory of it a few years back, on release. It's so satisfying and enjoyable to drink! It's not profound,but it is distinctly flavorful and "original" tasting." In New Zealand, Sue Courtney at Wine of the Weektested a gizmo called SpinWine that is supposed to aerate wine. Sue compared three distinctly different wines, Tempranillo, Montepulciano and Te Awa Hawkes Bay 2007 Pinotage. The SpinWine didn't impress but the Pinotage did. Concentrated, impenetrable, blackberry red hue. There's a tomato character to the aroma and a hint of a barnyard character too. A full-bodied wine in the mouth with soft tannins and bright, spicy, meaty flavours. Amanda at The Travelling Grape 'was so excited' about tasting her very first Pinotage which a friend of a friend had brought back to her in California. It was Diemersfontein Pinotage 2008 . Wow, a chocolate bomb on my nose right away with dark rich coffee beans. Could this be a Café Mocha lover’s answer? At first it was a bit hot and tickled my nose but that dissipated in time. The front of the palate was quick but the middle, whoa nelly…smooth like velvet with a hint of smoke and leather but the coffee and chocolate certainly stole the show. The finish lingered around a bit and left me yearning for a chocolate covered cherry. Very unique and I encourage each of you to get your hands on some to try. Hooray!!! A wine that is inexpensive, scrumptious, and organically/sustainably grown. For the price, it doesn't get much better than this. I haven't had a lot of South African wine, but I'm hooked. This Pinotage is sure to be a crowd pleaser. It's quite sweet and will appeal to the Pinot fans (Iswithi means "sweet" in Zulu), but it's cherry-sweet rather than sickly-sweet, and it's also full-bodied enough to win over Cab and Syrah fans. It happens quite often that uniquely handcrafted wines are overlooked in the chase for best value, yet quality wines. While the coffee-styled Pinotage is handcrafted by impressive scientific measures, the question remains - how unique is it? Bertus Fourie aka Starbucks Fourie (which makes him sound a little bit like a movie star) is the MD of Val de Vie Wines and creator of the infamous coffee-styled Pinotage, particularly invented to "demystify" wine, making it more accessible to the people. Fourie's coffee Pinotage career, of which the 'recipe' lies in a specific type of oak and toasting combined with specific yeast, took off at Diemersfontein and has since left a trail of coffee beans at KWV causing much controversy and tons of cash. Currently employed in a "purely management capacity", Fourie is in charge of the Barista Pinotage while his brother, Martin Fourie, is the official winemaker of Val de Vie Wines. Despite lots of criticism from the industry, the reaction by the public has so far been extremely positive not only in South Africa but also countries such as Singapore, the UK, USA and Canada. It is generally believed that Fourie "practically invented this style of Pinotage", but apart from using Pinotage, this method isn't so new Down Under. 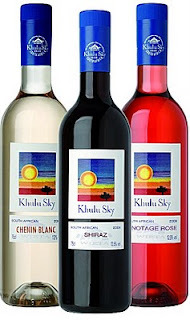 Although not with Pinotage, Australian wine company Wolf Blass already "exhibited some of these characters back in the late 70s," says senior wine judge and KWV consultant, Ian McKenzie. Although the focus has never been on these coffee-like characters, he continues, they "have always been recognized and described as barrel ferment artefact and have been utilized to varying degrees by different winemakers as a complexing agent". McKenzie has been working as a consultant to KWV since 2005. According to Prof Sakkie Pretorius of the Wine Research Institute in Australia, even though one can not "rule out the possibility of another (yet to be discovered) Pinotage-specific compound which is driving those coffee characters" it is more likely that those "characters are not exclusively associated with varietal Pinotage wines" and can in fact be used with any varietal. "We have found these coffee-like characteristics can be achieved in almost any red wine," McKenzie further explained, "provided the grapes are fully mature with ripe sweet fruit characters and importantly, ripe tannins". Yellowtail and Little Penguin are among a couple of currently available Australian brands that have "similar but not as pronounced characters" in many different varieties including Shiraz. The basis of Fourie's research however, was not done "on the enhanced coffee aromas, but the effect thereof on Pinotage due to the aromatic profile of this variety". Yes it can be done with any varietal, he explains over a cup of (real) coffee, but "not nearly the same result is achieved as with Pinotage". Although he has caused much controversy (albeit not on purpose), he remains a firm believer in the success of the Pinotage grape and believes that Pinotage handled correctly in the cellar and the vineyard "can produce a world class wine" - even without the added coffee aromas. 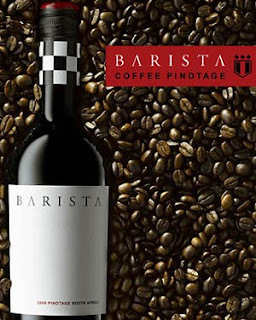 Though widely criticised, the 2009 Barista does show lots of fruit, soft tannins and a delicate yet very much recognisable hint of coffee and mocha - indeed, a very drinkable wine. Fourie, however, is "slightly disappointed in the 2009", for which he wished even "more coffee intensity" and scores the KWV Café Culture the highest point of the three - a wine described by Tim James as "squishy". Proving there is no such thing as bad publicity, the Diemersfontein 2008, KWV Café Culture 2009 and Barista Coffee Pinotage 2009 were voted top of the polls (in that order) during the Cape Town RMB WineX - popular wine show organised by Michael Fridjhon. The KWV Café Culture, sweet and sticky with overwhelming flavours of coffee and chocolate, seems to be the characteristics most non-lovers of wine prefer when drinking wine. However, Fourie is quick to assure that the Coffee Pinotage was not created in an attempt to camouflage the varietal characteristics but purely a decision of "supply and demand" thereby giving the consumers what they want. Pinotage Association vice-chairman and acclaimed winemaker De Wet Viljoen believes the key to any successful Pinotage lies in knowing that winemakers "work with a living thing (the vineyard) where there is no fixed recipe and the starting point is never the same". He prefers a Pinotage of which the primary fruit is not completely overwhelmed and feels the most important part of winemaking is to "recognise and stick to the varietal characteristics" of the grape. Pinotage certainly isn't a crude grape that makes for unbalanced and unsophisticated wines but merely asks for refinement; finding the elegance and the sophistication in the grape as proven by Abrie Beeslaar, Beyers Truter, Neil Ellis, Danie Steytler and Johan Malan. Almost like moving along the edge of a steel-point knife, every winemaker has "to strive for balance" - an important point that relates to any other varietal. McKenzie feels the level of the coffee-like characters found in Bertus's versions and the KWV Café Culture would in Australia "in all probability be regarded as overoaked". The truth is veteran winemakers have seen many vintages of Pinotage (and other varieties) make their way through the cellar and have by now recognised what they call "concept wines". The danger comes, De Wet explains, when critics and people start to "place Pinotage in a box", associating it with one particular style. "Different styles come and go but some things are timeless and will never change." Timeless or not, people seem to love a good trend and Bertus Fourie is most certainly enjoying the ride on this wave of success. Francois Naude retired from L'Avenir but he couldn't retire from wine making. Here he is talking about his own wine, Le Vin de Francois. I was very impressed with the poise and elegance of Altydgedacht Estate 's delicious 2008 Pinotage when I tasted it for the first time a few months ago. I was manning the Pinotage Association stand at the Wines of South Africa London Mega Tasting in October and this wine got many positive comments. Etienne Louw made the wine and he invited me to the farm in Durbanville to meet him and owners John & Ollo Parker. I asked Etienne to tell me about his Pinotage. The Parkers are the fifth generation to own the farm, which is quite large at 412h and stretches up the side of a high hill. Here the chill sea wind drops the temperature dramatically and its where the Parkers grow Sauvignon Blanc that the Durbanville area is rightly famous for. A little lower are their Pinotage vineyards. Much of Altydgedacht's vines are farmed on contract basis for wineries such as Nederburg. A central block of Pinotage, marked by coloured ribbons tied to the end of the trellis, are reserved for Altydgedacht and it is these that made the 2008 wine that won the 2009 Top 10 competition -- the first Durbanville wine to do so. Not all the farm grows vines: the Parkers also grow grain and reserve large tracts of the original renosterveld vegetation, on which Ollo's wife is an expert. Ruth Parker wrote the book Renosterveld: A Wilderness Exposed. Her husband, Ollo, is the cellarmaster while brother John is viticulturist. Etienne arrived in 2006 to take over winemaking duties. He has many plans. He used to work at sparkling wine specialists J C LeRoux and he is experimenting with a methode cap classique at Altydgedacht, and the un-degorged bottle I tried was impressive. But old favourites are safe. Altydgedacht make one of the Cape's few Gewurtztraminer wines, a nice example which, they tell me, is very popular in America. They also make a rare Barbera, a variety they pioneered, and which I later greatly enjoyed with pasta. On the way down from the vineyards Ollo stopped to fasten some loose vines. I was intrigued by the tool he used that seemed to work by just pointing at the vine. Marisa D'Vari at A Wine Story has posted an interview with Kanonkop winemaker Abrie Beeslaar about his 2007 Pinotage. Pinotage, a grape native to South Africa, is rarely seen in California, but George Bursick of J Wine Co. in the Russian River made a 2006 pinotage that is probably the best version of the grape I have ever tasted. At $38, the wine isn’t cheap, but it is startlingly excellent." says Dan Berger in The Napa Valley Register.